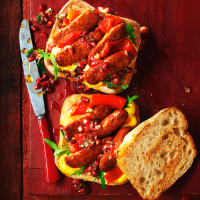 The full-on flavours of the chorizo and saffron aioli are balanced by a tangy relish. 1. Preheat the grill to high (250 ̊C). Place the peppers on a baking sheet and grill for 12-15 minutes, turning regularly, until blackened all over (or do this over an open flame on the hob). Put in a bowl, cover with cling film and leave until cool enough to handle. Peel off the skin and discard with the stem and seeds. Roughly tear the flesh; set aside. 2. For the aioli, crush the garlic, saffron and a large pinch of salt to a fine paste in a pestle and mortar or on a board, before mixing with the mayonnaise; season, adding lemon juice to taste. Mix all the ingredients for the pomegranate relish together in a separate bowl and season to taste. 3. Heat a griddle pan or heavy-based frying pan over a high heat. Halve the bread rolls and cook, cut-side down, for 1-2 minutes, until toasted; set aside. Next, add the chorizo to the pan and cook over a medium-high heat for about 3-4 minutes on each side, or until crisp and the oils have been released. 4. To assemble the sandwiches, layer up the aioli, rocket, relish, peppers and chorizo on the rolls, finishing with extra aioli and relish, a few more rocket leaves, and a final drizzle of the chorizo oil.